Wondering whether to try the just-released beta of Internet Explorer 9? I’ve put the beta through its paces in a review for Computerworld. Here are five reasons IE9 is worth a try. It’s sluggish no longer. Tests I ran on IE9 show that it’s now faster than Firefox. It completed the benchmarks in an average time of 432 ms, faster than Firefox 4 beta, which completed them in 535 ms. It was still slower than Safari, Opera, and Chrome, but not by a wide margin: Safari completed them in 387 ms, Opera in 343 ms, and Chrome in 322 ms.
IE9 features a cleaner-looking, stripped-down interface with tabs at the top. Gone are most buttons, menus, and controls. True, now all the browsers look basically the same, thanks to Chrome’s interface innovation. But that’s not necessarily a bad thing. And in IE9’s case, it’s a very good thing. However, by default, a Bing toolbar is turned on, conflicting with the clean look. If you’re not a fan of toolbars in general, or Bing specifically, it’s easy enough to turn off. Add-ons can add a lot of overhead to browser load time and browsing time. Load down your browser with enough of them, and no matter the browser’s basic speed, it can become sluggish. 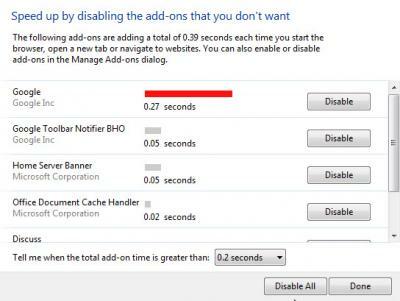 IE9 has a very nice feature that automatically warns you via a pop-up when your add-ons increase load time and browsing time, and let you disable them. (If you want, you can later turn them on.) You can see the new tool in action, below. Other browsers, notably Firefox, would do well to follow suit, and develop tools like this as well. If you’re a Windows 7 user, you’ll find some useful features designed for that operating system. You can pin a Web site to the taskbar for easy launching, especially important in a world in which Web-based apps are replacing desktop apps. When you launch a pinned site, IE9 automatically takes on the color of the site for its forward and back buttons, and displays the Web site’s icon on the upper left of the browser. In addition, developers can make use of the Windows 7 Jump List feature for pinned sites. So a news site, for example, could let people immediately navigate to a sports or technology section directly from the taskbar, without first having to launch the browser, and navigate. IE9 takes not just its new look from Chrome, but another innovation as well — having the Address Bar do double-duty as a search box. So you can either type Web addresses or search terms. Microsoft calls it One Box. No matter what you call it, it’s useful.